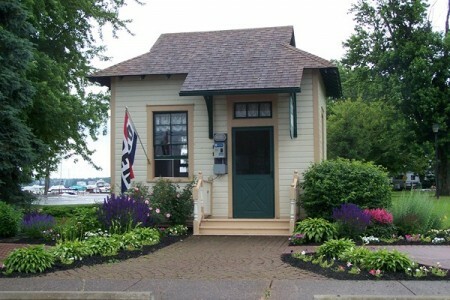 This is a narrated walking tour of 19th Century Architecture in Historic Sodus Point. The tour begins at the Information Center . The tour is .8 miles long and is of moderate difficulty. The tour consists of 12 buildings constructed in the 19th century. Depending on how much time you take listening to the audio and reading the historic narrative for each site, it should take approximately 60 minutes to complete. At each site, when you click on the bubble on the generated map, you will see an audio button you can click on. When you click the link below, it will generate a map showing the location of each of the 12 sites represented by a bubble marker. Your tour starts at the site that is colored green. The tour starts at the Information Center(12-083 on the map). The tour directions are on the left, leading you from site to site. Click the bubble for each site on the map and it will bring up photos and information about that site. You will notice the Tour Sound Bite button that you can click to hear the narration for each site. The audio may take a few seconds to load. To go back to the map, click the left arrow at the top of your screen. Head west and continue on to the next site (Harris House at the top of the hill which is labelled 12-160 on the map) and repeat this process. When you have finished the last site click the X button on the top right of your screen to exit the tour.